In 1982, Concordia Publishing House printed a book by Walter Koehler, Counseling and Confession: The Role of Confession and Absolution in Pastoral Counseling. The book weaves a multilayered account of the relationships between psychology, pastoral counseling, and the theology of individual confession and absolution. It quickly became a key part of the movement within the Lutheran tradition to restore the place of private (what Koehler prefers to call “individual”) confession in church practice. The book has been out of print for years. But working together with Dr. Rick Marrs (Concordia Seminary’s dean of faculty and associate professor of practical theology), Walter Koehler’s widow Eunice Koehler, and the Biblical Charity Continuing Education program, a new edition of Koehler’s magnum opus is now out. We would like to particularly thank the Biblical Charity Continuing Education (BCCE) program, funded by the Biblical Charity Institute, for providing the grant that covered the cost of printing the book. 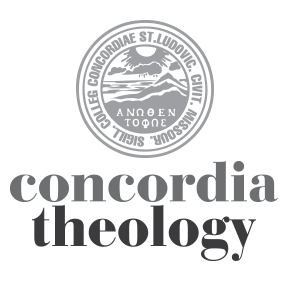 Also, to mark the release of the book, Concordia Seminary faculty have produced a new downloadable sermon series called The Way of Grace. Centering on the sacraments, the sermon series provides two sermons on confession/absolution, two on baptism, and two on the Lord’s supper. Dr. Marrs himself wrote the two sermons on confession with Koehler’s book in mind. The series is appropriate for Lent (it also includes sermons for Maundy Thursday and Good Friday), but is geared for any time a preacher may wish to focus on the sacraments for catechesis or liturgical renewal. Anyone who purchases Koehler’s Counseling and Confession ($19.95) through Concordia Seminary Press gets the sermon series ($9.95) for FREE. For more information or to place an order, go to store.csl.edu or contact the Sem Press at sempress@csl.edu or 314-505-7117. It is also available at amazon.com and the Seminary’s campus bookstore. St. Paul said it first: “If anyone aspires to the office of bishop, he desires a noble task” (1 Timothy 3:1). Indeed, shepherding souls is incredibly rewarding work. Yet let’s face it, aspiring pastors face an increasingly complex task when it comes to shepherding the lambs and sheep of Christ. Guiding and directing them through the perilous spiritual terrain of our time takes all the skills they can muster and all the tools they can collect. Concordia Seminary is to be commended for reprinting Koehler’s Counseling and Confession at this juncture. This book deserves a place in the toolkit of every pastor who takes the care of souls seriously, even though it is clearly targeted at the pastoral care scene in a bygone era. Dr. Marrs’ introduction highlights many of the developments in the field of Christian counseling since Koehler published his study in 1982. As he points out, there has also been a resurgence of interest in the classic understanding of soul cure (Seelsorge), especially in the last two decades. Still, Koehler’s was an early and vital voice recalling Lutherans to their heritage regarding the central role of individual confession in pastoral care. In many ways, however, that conversation has only begun, and the exact relationship between counseling and confession has yet to be defined. As Koehler himself notes, individual confession and absolution was championed by pioneers among American Lutherans. Dr C.F.W. Walther, for example, encouraged nineteenth century pastors to work towards its complete integration into parish life: “…in an evangelical way, through instruction and exhortation, and through praising it, [he should] work toward the goal that it be diligently used in addition to general confession and that, where it is possible and advisable, it be finally reintroduced as the exclusive custom and that it be properly preserved where it exists.” Yet evidence is that the practice was all too rare throughout much of the twentieth century. Future historians of our church will likely note that only four years after the publication of Koehler’s study, a new edition of Luther’s Small Catechism was published (Concordia Publishing House, 1986) which restored Luther’s rite for individual confession that had been omitted in the 1943 edition. For the first time in nearly three generations, Lutheran boys and girls had a working model of how Christians confess their sins to their pastor and receive absolution from their Lord through him. Recent decades have seen heightened interest in this time-honored gift. But historical interests alone cannot explain the increasing attention being devoted to individual confession (absolution) in these early decades of the twenty-first century. Pastors do not do pastoral care merely out of historical affinity, after all; every generation uses the tools and skills commended to them by their Lord in his Word. Until he comes again, the Lord Jesus commands his servants to preach, to teach, to baptize, to commune, and to absolve in his name. “Receive the Holy Spirit,” he says. “If you forgive the sins of any, they are forgiven; if you retain the sins of any, they are retained” (John 20:22-23). May this book’s republication contribute to the ongoing recovery and faithful use of individual confession and absolution for the joy and edifying of Christ’s holy people for generations to come! Trans. John M. Drickamer, Walther’s Pastorale, (New Haven, Mo: Lutheran News, Inc., 1995), 120. Martin Luther, “A Brief Admonition to Go to Confession,” Large Catechism (St. Louis: CPH, 1978), 124.